A process is a series of events, one taking place after the other. Therefore, to connect your stages, you should use ‘time connectors’. 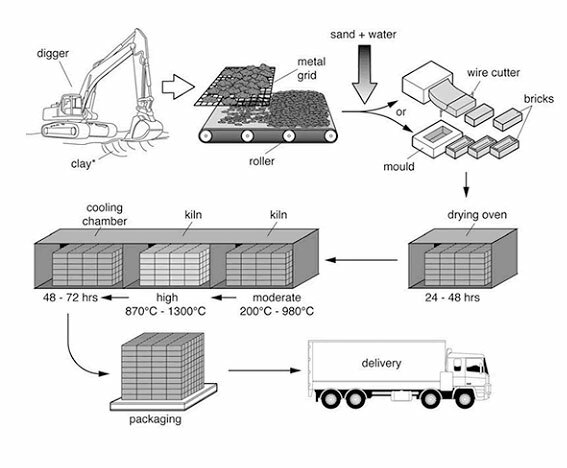 Following this, sand and water are added to the clay, and this mixture is turned into two differing types of brick by either placing it into a mould or using a wire cutter. Next, these bricks are placed in an oven to dry for 24 – 48 hours. A large digger digs up the clay in the ground. To begin, the clay (which) is used to make the bricks is dug up from the ground by a large digger. This clay is then placed onto a metal grid, onto a metal grid, which is used to break up the clay into smaller pieces. A roller assists in this process.